This unique and original program has been created for middle and top managers in the business world. English knowledge is essential in our modern life. The importance of English is even more visible on international platform. In the business world proper English language ability can help people and companies stay one step ahead of the competition especially when it comes to communication. The Executive Club UK programme organized by InterCon UK is tailored for business people whose time is limited and who wish to make best use of their time in UK and improve their English. The Executive Club UK is a tailor-made program and it can be specified according to business people`s needs. Your Executive Club UK consultant will ensure that applicants spend their leisure time effectively and will lead trips to companies which are in the same business area as the applicant. The applicant can discuss his business ideas with companies in the same business sector in the UK and make business connections if so desired. During this programme, Executive Club UK consultant will always ready to help and will remain in communication with the applicant until he or she returns home. 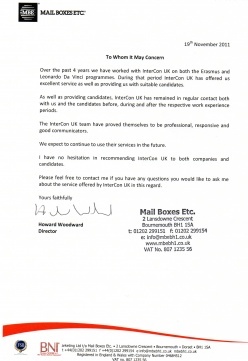 InterCon UK is in contact with the most prominent companies in the UK. For further information and a personal program please contact our Executive Club UK Consultant by filling our online request from below. This page has been updated on 16. January 2019 15:03.